I Was Here by Gayle Forman was a good read ... it would be surprising that a book by this amazing author wouldn't be ... I quite liked how messy and complicated the friendships, romantic relationships and the families are but at the same time, I didn't always feel as emotionally connected to the story as I would have expected. I Was Here tells this story of Cody, an 18 year old girl, who has learned of the unexpected suicide of her best friend, Meg. In an attempt to help Meg's parents out, Cody goes to clear out Meg's things at university and in the process tries to uncover what Meg's life has been like and piece together her motivation for suicide ... which takes some turns for the dangerous. I quite liked Cody as a character and this journey she goes on towards discovering Meg's secret life. Over the course of the novel, Cody seems to reconcile the guilt at not knowing and also the guilt that comes with the distance that appears in her friendship with Meg as Meg goes off to university and Cody is left behind unable to afford the same experiences. Another aspect of the book that really worked for me was the romance element. I love that everyone involved concedes that these two people are a great case of wrong time, wrong people together, but as I've already said, I quite liked how messy and complicated that relationship is. There are parts of I Was Here that are really beautifully written and have a lot of honesty and emotion and insight to them. But for me, in some ways I felt a little bit disconnected from this story. I think that this is in some parts because I felt like the second half felt a little bit strange. It sort of veers off track of the grief and confusion of Meg's death and goes more into detail about suicide support websites and one person in particular who plays a helping hand in Meg's suicide. I liked the road trip element of this part of the book but I wasn't quite sure about this hunt for justice that Cody goes on nor was I particularly thrilled with the eventual outcome of this mystery surrounding Meg's suicide. I will always love Gayle Forman and be excited about her books. I think even a book that I didn't love as much as her others is still an amazing book so again, I do highly recommend this book. It's interesting that you mention feeling disconnected because that's the way I feel with Gayle's books. I love the stories and the characters and they do evoke emotion but there's always something...missing. This one sounds great but I'm fearful that it'll be a similar experience! Great review, Michelle! Thanks, Danielle. I don't normally have a problem with that (except maybe Just One Year? but I figured that was because Willem was just way different than I expected him to be). 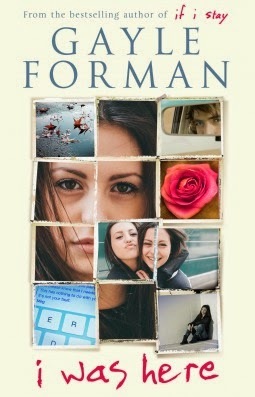 I've loved all four of the previous books by Gayle Forman that I've read.